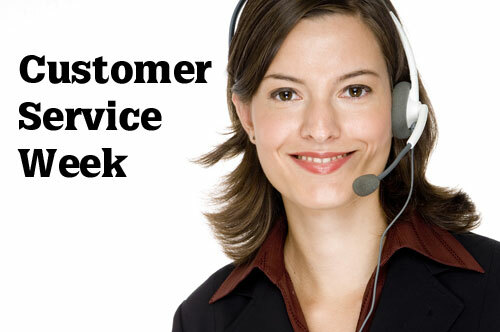 Customer Service Week is celebrated every year in October. Start planning now to make it a week to remember! The simple fact is businesses prosper or fail largely because of their customer service. The moment that any organization loses sight of the fact the Customer is King (or Queen) then they are riding for an inevitable fall. So what kinds of activities will take place during Customer Service Week? Obviously you want to congratulate and reward your front line customer service people. They are the ones who bear the brunt of dealing with the public every day, and that isn’t always easy. Then you need to involve the rest of your staff – the backroom boys and girls – to their role in customer service. Finally, you need to explain to your customers how much customer service means to your organization, and demonstrate how you are putting it in the center of your business. The Customer Service Week website is just bursting with ideas for how you can make a big and lasting impression on your staff, and your customers, and yes, why not your suppliers too? After all, they are part of your team. The bright “Think Service!” logo features on all of the items in their range of support and promotional items, giving you a theme to use for the whole week. One great idea is to have your customers nominate the Customer Service Person of the year. You are looking for really outstanding performance. For example, I was staying at a small resort, Steppingstones, in Belize. As I headed off to the airport after an idyllic vacation, I didn’t realize that I had left one of my suitcases behind – a huge one at that. Luckily, about half an hour after I’d left a staff member spotted it tucked away on my veranda. He rang the internal airline I was flying with, and let them know the case was on its way. He drove like a mad thing to the local airport, and put it on the next flight to the International Airport (my flight having already left) where staff matched it up with my onward flight. It was waiting for me on my arrival. I hadn’t even noticed it wasn’t with me! Superb customer service all round. This is the kind of service level that customers never forget, and which you are looking to reward. An important part of customer service is for departments to cooperate well with one another. Sometimes in large companies, it’s hard for staff members to develop relationships. That’s where local community service projects come in. Perhaps you can have a food drive for your local homeless shelter, or a sponsored run to raise money for the orphanage. Whatever you do, make sure that you mix departments together so that people can meet each other. One of the many great ideas to be found on the Customer Service Week website is to have a chili cook-off. Each department creates it’s own special chili (or it could be apple pie, or barbecue, or jambalaya, or whatever is popular in your area) and everyone goes from department to department tasting the yummy offerings and voting for which one is best. Make it a dollar per vote, and the money raised goes to a good cause chosen by the staff. Whatever you do, you need to make sure that you have solid reminders all around your business premises. Badges, posters, balloons, cups, thank you cards, certificates of appreciation, service awards – just about everything you can think of to make customer service week go with a swing. As Mahatma Ghandhi said, “The customer is not an interruption to your work, he is the reason for your work.” How many times do we go into a shop, a service outlet, a government department, and feel as if we are just completely unimportant to the people working there? You don’t want your business to be like that, do you? Of course, you work hard on developing good customer service. But good customer service comes from the heart, not from a book of rules. Everyone in your company is part of customer service, so don’t leave anyone out. My father had a very modest job all his life, and after he retired, he felt bored, and wanted to make a little money too. So he took a job in a local factory which made highly specialized machine tools (in the days when such things were made by men, not robots.) His job was to keep the factory floor clean, including the washrooms used by the workers. He enjoyed the work, which meant he was with other people instead of stuck at home, and he took great pride in making sure everything was always so clean, you could virtually eat your dinner off of the floor – not an easy task with ample oil and grease and metal dust around. One day an important buyer came to visit the facility. The top brass of dad’s company came through the factory floor, inspecting everything. So my dad was part of customer service, and he was made to feel very proud of his work in no uncertain terms. That’s the feeling you want your people to have. Over forty years later, we understand more about the need for great customer service. And we have more tools at our fingertips to reach out to both customers and staff. Those companies who not only use those tools, but believe in making customer service the center of their operation will survive and thrive. By showing the world you care about your customers and your employees this customer service appreciation week—and every week, you will surely will be among those who thrive. Ellen Goodwright is a freelance writer and a passionate customer service advocate! You can read more of her customer service tips at Customer Service Basics.